As a teacher Wendy feels it is her job to help you and your horse be harmonious and confident in whatever you want to do. Wendy’s success lies in her hands-on approach, showing you how to do what you need to do in addition to telling you the what, why and when. Wendy’s understanding and ability to relate to you and your issues due to her personal experiences means that she knows what you are going through! Her patience stems from her vast tool kit, which allows her to find your individual keys success. Wendy’s keen eye sees the underlying cause for disagreement between you and your horse in seconds so that your valuable lesson time isn’t wasted. She then distills your issues down to the fundamental causes and addresses the root of each problem in order to eliminate whatever is holding you back from achieving your riding goals. In this way you make exponential progress in every lesson! Choose from the following selection or contact Wendy to create a clinic tailored to you and your clientele. – Learn how to do what great riders do! Wendy breaks down complex concepts into a step-by-step lesson plan so that each student goes away with a solid understanding of how to maintain what was learned at the clinic and continue making progress between clinics. 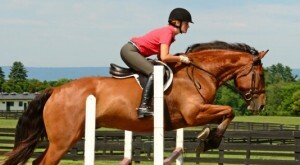 Clinics include students that have ridden with Wendy before and those new to her. Riders are grouped accordingly and the new rider lessons serve as a great refresher for those who are returning while the lessons for riders familiar with Wendy advance their knowledge and skills. – Have Wendy all to yourself! For up to 12 riders but generally these are smaller clinics so that each person gets lots of individualized attention in a group setting. Private Lesson Days – typically open to anyone who would like to attend, lessons are individual, semi-private and small group lessons. Effortless Rider® Workshops – Unmounted workshops held indoors. 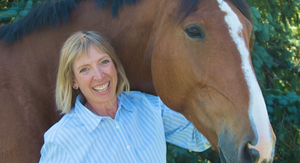 Wendy covers a wide variety of topics including lectures on anatomy and physiology, correct rider function and a wide variety of exercises that riders can use to improve their riding. – A great way to learn new possibilities of movement as they apply to improving your time in the saddle. Feldenkrais lessons are hand picked based on the group to meet the needs of the participants. Intensive Study with Wendy – After an initial assessment, Wendy will create and execute a program specific to the individual horse and rider. You can travel to Virginia and work with Wendy or she can come to you. The number of hours/day and days is variable and depends on the individual circumstances of each student. SURE FOOT Equine Stability Program® Workshop – Learn how to use SURE FOOT under the watchful eye of Wendy, the creator of the SURE FOOT program. 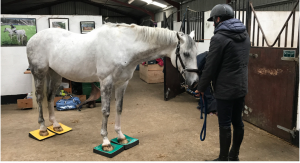 Workshops give people interested in using the SURE FOOT pads a opportunity to understand when and how one should use the pads in a variety of circumstances based on the horses attending the Workshop. Levels of participation include; auditors, participants without horses, horses mounted or unmounted.